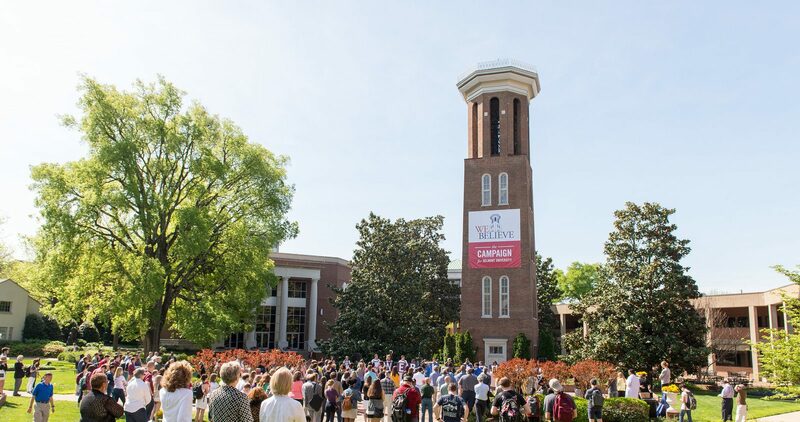 Ten months into the “We Believe” comprehensive fundraising campaign, Belmont University announced today that donations recently surpassed $100 million, marking a major milestone toward a total $300 million goal by 2020. The campaign focuses attention on five areas that are key to the University’s Vision 2020 strategic priorities, including scholarships, faculty support and missions. Total money raised to date for the campaign currently stands at $100,162,799. To date, more than 10,000 donors have contributed to the campaign, and nearly 70 new endowed scholarships have been created. Highlights since last April’s public campaign launch include the largest single gift in University history ($15 million from the Ayers Foundation) along with gifts to create a $2 million endowment to support Belmont missions and a $4 million endowment for ‘Bridges to Belmont’ (the first made possible by Trustee Jim Wright and his wife Susan while the latter results from a gift from Trustees Joe and Anne Russell, respectively). The $300 million campaign will include total money raised through Dec. 31, 2020. Thanks to a long history of strong financial management and diligent cost control, Belmont is able to partner with its supporters to leverage their investments in the institution’s future. The University is matching contributions to campaign priority endowments between $25,000 and $1.5 million ‘dollar for dollar,’ doubling the impact of each donor’s commitment. Click here to view the “We Believe” campaign launch video. For more information on the campaign, giving priorities and ways to give, visit Belmont’s We Believe website.